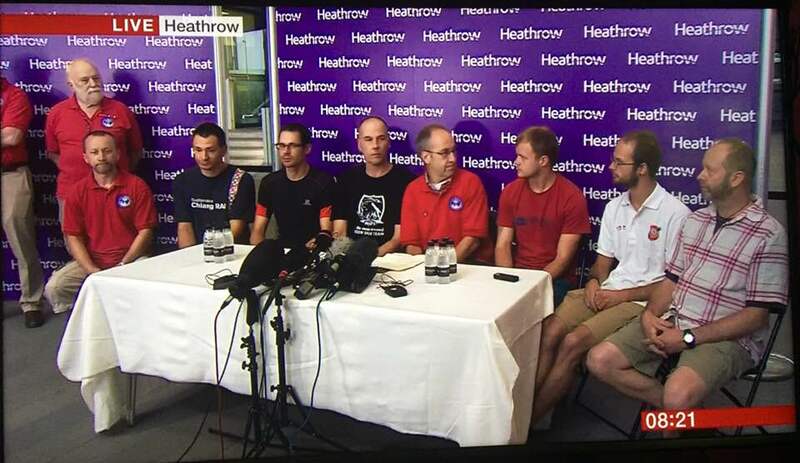 Within the last few minutes there has been a press conference at London Heathrow with some of the British team that were involved with the cave diving rescue in Thailand. Josh Bratchley, Mike Clayton, Chris Jewel, Gary Mitchell, Connor Roe, Rick Stanton and Jim Warny flew in overnight. Peter Dennis, Chairman of the British Cave Rescue Council welcomed back the BCRC team from one of the most extraordinary cave rescues ever seen. "The international collaboration has been an inspiration", he stated. Dennis then shared the BCRC's condolences with Saman Kunan's family and friends. On Tuesday 26 June 2018 the British Cave Rescue Council received a phone call from the Thai authorities asking for specialist help. The volunteer organisation is formed from cavers and rescue teams who have decades of experience. Peter Dennis stated "the skilled cave diving team you see before you are in a class of their own. They are drawn from the UK caving community, and have been able to support the Thai rescue plan in saving the 13 young people, who have shown great inner strength and bravery in their rescue." The team introduced themselves before questions were put to them. Rick Stanton was asked how the team felt when the children and their football coach were found. "Initially of course there was excitement, and relief that the children were still alive. We could not see them initially. As they came around the corner and down the slope, we were counting them until we got to 13. It was unbelievable. The group still had light, but we gave them extra light. They looked in good health. But of course when we departed, all we could think about was how we were going to get them out. So there was massive relief tempered with uncertainty." Rick Stanton explained "there was a lot of chaos, but we were so task orientated and focused that we blanked that out, and carried on with the job in hand, step by step, until we achieved success. Rick Stanton stated "This was completely uncharted and unprecedented territory. This is an order of difficulty much higher than anything that has been accomplished anywhere around the world, by any other cave diving team. Of course there were doubts." "We are not heroes. We are using a unique skill set which we normally use for our own interest, and sometimes we are able to use that to give something back to the community. That is what we did." The BCRC team said that the Thai authorities took a lot of steps to divert rivers on the mountain top, which is thought to have bought additional time to achieve this outcome. Rick Stanton concluded the interview with an observation about the entire rescue team. "We knew we had a good team, with good support from the Thai authorities, the national caving community and the rescue organisation, so we had the best to make a plan work."